*I'm counting each of these kits as 4, sort of arbitrarily on the basis of roughly how much painting the terrain in the box is probably going to take. I keep my Sector Mechanicus/Imperialis Terrain modular enough that it's not really possible to come up with a more specific number of "Models" I'm getting from each box that's also reasonably useful for purposes of tracking like this. Net improvement of 8 Models. Less than ideal, but better than I expected. I think I'm going to see if I can manage double digit improvement over the next three months (well, 2 1/2 now) until the end of June. Things are pretty hectic here still, but I am plugging away when I get the chance, and hopefully I'll have something to show off before too much longer. Until next time, y'all have a good one, y'hear! Oh and btw, that 2nd mini pictured, the one jumping off from the tentacle is still a mightily impressive paint job!!! It was more just curiosity. The goal is tracking over the whole year, and since I'm posting everything I finish, it's easy enough to go back through it for any given time period. Thanks! I'm still really happy with how the Tenebrael Shard came out. It was actually a very simple paint job. Even including the base and the wash I only used 8 paints total, and no fancy techniques. A bit of drybrushing on the black parts, but everything else was just flat base coats and a wash. 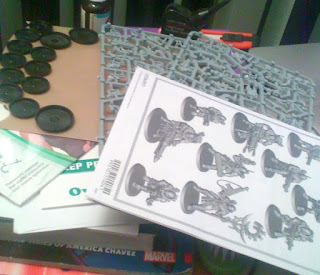 I have never been able to bring myself to track hobby progress as a numeric metric. I know for me it would be counter-productive. I'd fret over pushing the value higher, not be able to do so, then feel bad about it. However, I totally get the idea of it and I know it works for some people. Rambling aside, solid work. Also, that Wych Elf model is awesome. I couldn't do it to the extent some people do, but a rough count like this seems to not be causing me too much trouble so far. It's also helping me keep blogging more, because I'm posting everything I finish so I have a record of it all. Yeah, it's a fine line to walk, for sure. Nice work! Particularly like the Ryza Pattern ruins, that orange and grey scheme is very nice. Quarterly model counts is probably a much better idea than the huge reckoning I slog through at the end of the year. Reckon I'm probably ahead on painting rather than purchasing, as usual. The one advantage of being skint! Thanks! Originally they were going to be all orange, but then I saw The Responsible One's, and he did them two-tone and it looked great, so I decided to go for it as well. So glad I did, I'm so much happier with them than I would have been with the all orange. I'm going to be tracking over the whole year. This just seemed a convenient place to take stock for the moment. And really, I shouldn't have bought even as much as I did, but there's just too much awesome stuff coming out! A) You've said you're in a bit of a slump. Nothing wrong with that. B) The quality of work you produce is well past anything I've ever done. C) Tracking like this is sometimes useful, sometimes not. This is the first time in over 20 years of 40K that I've felt like it was worth doing some tracking. Who knows if I'll find it worth keeping up. It's an experiment.